Our Vision is to be the premier Australian multisport community of all ages & abilities assisting members to achieve their personal goals. We are doing this by: connecting like minded people, developing juniors, professional coaching, running quality races & being the number 1 club in NSW! But don't worry, our race committee are hard at work planning for the season to come! We hope you enjoyed our races and look forward to seeing you out racing next season. Stay tuned for updates on our plans to keep you active, motivated and of course having fun through the winter. Thanks to all of our volunteers and congratulations to all that raced in our sell out, last of the season April race. 3rd in this year's NSW Triathlon Club Championships. A fantastic weekend and some great results from our members. Thank you to everyone who came and raced or volunteered. In addition to the formal committee positions, the club also has a number of sub-committees. 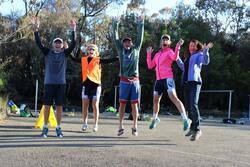 These sub-committees do not require a formal nomination process, but if you would like to be involved please contact David Wiles(president@warringahtriathlonclub.com). These are essential if we want the club to continue building the way it is. They will be largely autonomous, and meet with the Executive on a periodic basis. A successful club is built on the back of dedicated volunteers, so we'd encourage as many of you as possible to get involved!